By Nancy Young in WordPress. Updated on October 25, 2017 . Using caching plugins is probably the easiest way to to speed up your WordPress site. However, you might end up getting your sitemap cached too and that’s not a good idea. The XML sitemap should always reflect the latest posts and urls of your website so search engines get the latest version of whatever’s updated. In this post, I’d like to share with you how to exclude and prevent XML sitemaps from being cached (unintentionally) by some of the most popular WordPress Caching plugins. 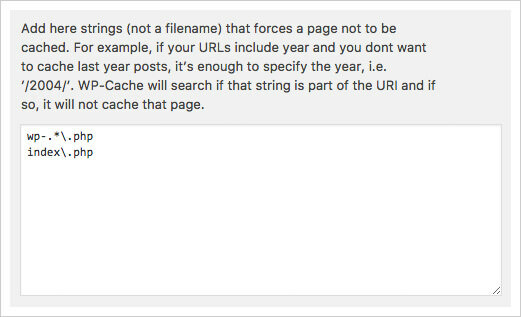 Note: If you are using Database Caching, you need to add the same lines to the "Never cache the following pages" under Performance Database Cache. If you are using Minification, open Performance > Minify and enter the same lines in the field saying "Never minify the following pages". Last but not least, go to Performance > Browser Cache and ensure the same lines are in the "404 error exception list" section. Go to Settings > WP Super Cache. Open Advanced tab. Go to Settings > WP Rocket > Advanced Options. Note: Make sure to clean your cache each time you make these changes using these three plugins.